28 Days. That's the average wait time in the U.S. to see a therapist. With online therapy, there's no need to wait. From our experience, we recommend BetterHelp the highest out of all online counseling platforms that we've reviewed. 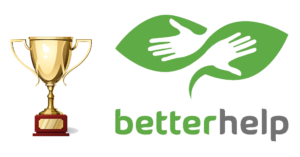 BetterHelp has over 2,500 fully-licensed counselors on their platform, and has helped over 500,000 individuals get help. Pricing costs between $35 and $70 per week, which is less than traditional in-person counseling, plus you can do it from the convenience of your own home.